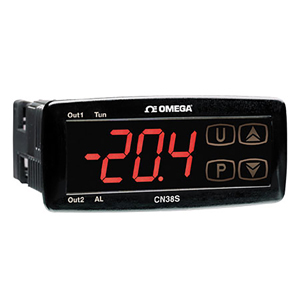 Monitor and control temperature with precision using the CN38S Series controllers. The CN38S Series offers an innovative solution for programming through an ergonomic keypad which uses the technology “Sensitive Touch”. This sensor keyboard guarantees complete protection from dust and liquids in every critical environmental situation. Providing on/off control or PID control with Autotune, this controller is the solution for many applications. The CN38S series offers a soft start feature. This function makes it possible to eliminate thermal shock and mechanical stress (due to dilatation) that a system undergoes during start up. In other cases the aim is that of slowing down the increase in temperature in such a way that this can spread itself out evenly inside the material, especially when the machine is equipped with ‘stirrers’ that cannot be started up at room temperature. The CN38S also offers a compressor protection time feature, where some actuators, compressors, and pumps cannot be turned off or turned back on too quickly for their constructive characteristics. To protect the working life of the device it therefore becomes essential to be able to activate a timer that guarantees the minimum time between the switching off of the machine and the following start up. 注: Comes complete with operator's manual.